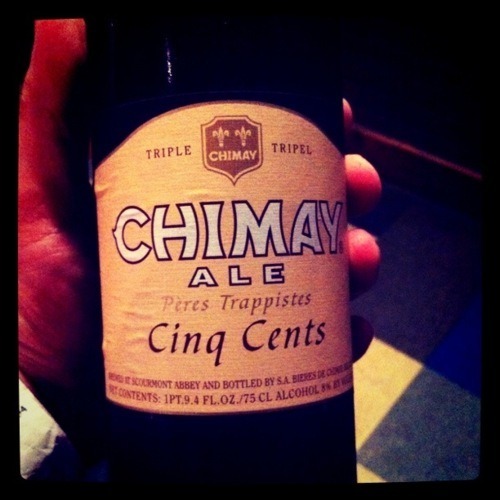 Sitting between gold and amber in color, Cirq Cents is unquestionably the driest and hoppiest of Chimay’s beers, with a grim but rather austere maltiness supporting spicy, bitter hops and dry fruitiness, ending in an poetizing mix of faint acidity, bitterness, and alcohol. The beer smells clean… fresh… and wet. I have heard nothing but good things about this beer. Chimay is known for making good brews. Last week we did another Chimay. I hear this one is dry… and boy, I like dry beers. The beer has a pretty complex nose, so let’s see what this tastes like. The beer has a ton of carbonation. You are smacked with carbonation on the front of the palate. Then you sit there and wait. You want something to happen; you want there to be some sort of flavor. And there isn’t. Nothing… No, I am serious. This beer is known for their intense flavors. But it lacks in every sense of the word. I feel really bad rating a beer this expensive so low, but I have to be honest… the only thing that this beer brings to the surface is a subtle sweetness. I am glad that the red isn’t on the list. Hold on though. Let me go back to the sweetness I am experiencing here. Yeah, that’s it. The beer just lacks on so many levels. It’s better than a domestic… but that’s about as far as I would go. I just heard Sheryl say, “This is what a domestic beer tastes like in a foreign country.” I would have to agree. Even though I didn’t like it doesn’t mean you won’t! Just not for me. Second night at the Beer Sellar! If you’re reading this, you should come join us on Monday nights. We are here on Mondays at 9 pm, and we’d love for you to join us! The more the merrier. Tonight’s beer is another Chimay. It’s a big bottle. (Yay!) It poured out with a little bit of head, in a sort of orangey color, kind of thick. Looks like an ale… what does it smell like? Honestly, the smell isn’t very strong. It doesn’t smell like much of anything to me. Let’s find out what it tastes like. Tastes kind of carbonated… and… not much flavor. Why are these beers so expensive?? Chimay is supposed to be this really great beer. I just don’t get it. This one has little to no taste to me. It doesn’t taste bad, but I feel like I’m drinking ginger ale, except not as sweet. Second and third drinks… still nothing. All I can taste is the carbonation, with a little bit of an aftertaste. The aftertaste is kind of a generic craft beer taste. It’s better than a domestic, but I just can’t find any flavor. Not something I would likely spend money on again. Welcome to Ground Control: X marks your new spot.